Vintage 1959 Magnet, Laboratory Analyzed 1959 P.A.F Magnet, 100% Identical Reproduction. The best, truest sounding humbucker set for your Gibson Les Pauls or SG's. This set uses all P.A.F parts, Vintage Correct Nickel-Silver Alloy base plate, double black bobbins, 42 gauge Dark Purple Plain Enamel magnet wire, a Real 1959 P.A.F Laboratory Analyzed Alnico Magnet, uses Our Specially Made Vintage 1959 Alloy Polepieces. Nickel covers, steel braided 2 conductor hookup wire, just like the originals. This set has a clear, sweet, fat low end that is strong and punchy. The top end is clean and has a great presence that balances great with the pickups punchiness. 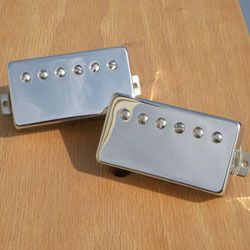 If you are in the market for a lower output early P.A.F humbucker tone this set is for you. The Artists we have, have this to say about the P.A.F's. They have the same Dynamics & Timbre as the originals and they have a real sweet (slight) compression in the mids and highs. True 1958 Set: Neck & Bridge Average Output (7.2k). Middle also available for Triplet Sets. The Average Output is shown, we wind the pickups to a set number of Traversed turns, Asymmetric Coils. 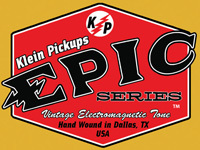 These Pickups have the tone, feel, and smell (Butyrate) just like the originals. You won't find anything more authentic.